An 2010 account of the life and work of Hans Eysenck, by Roderick D. Buchanan, reviewed by Eysenck's son Michael. 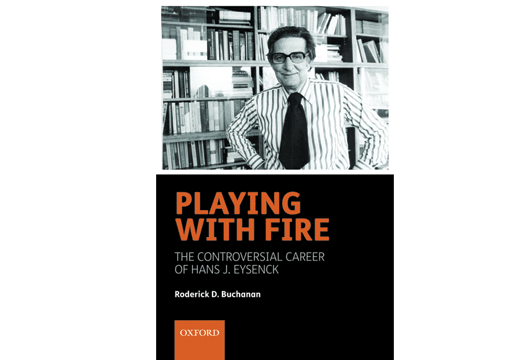 Buchanan’s book provides a remarkably accurate and comprehensive account of my father Hans Eysenck’s life and research; indeed, it is definitive. What is especially impressive is his success in evoking the flavour of the long-distant past in British psychology. Unlike most other critics, Buchanan is scrupulously fair-minded in his assessments of my father’s research. As a historian, he is understandably less concerned with the strengths and the limitations of that research than research psychologists. The most important research strength of my father that receives relatively little attention concerns the controversy as to whether we should think of personality as consisting of numerous correlated personality traits or as a much smaller number of orthogonal personality dimensions. The former view was easily the more popular until about 20–30 years ago. However, the latter view (espoused by my father) was eventually shown to be clearly preferable and now dominates the field. Almost uniquely in psychology, my father’s proposed three-factor descriptive model of personality remains largely accepted 60 years after it was first proposed. Another strength not focused on by Buchanan was the importance my father attached to the heritability of personality traits, which led to several twin studies. It was commonly assumed (especially in North America under behaviourism) that individual differences in personality were entirely determined by environmental factors. There is now irrefutable evidence that genetic factors are important. My father also assumed there is continuity between normality and abnormality and that a dimensional approach to abnormality is preferable to a categorical approach. Both assumptions are accepted far more now than when my father endorsed them several decades ago. What were the limitations of my father’s research? The most obvious one is that he frequently espoused controversial viewpoints (typically supported by in-house research) that have totally failed to stand the test of time. Here are a few examples: criminality is associated with extraversion; personality strongly determines longevity; smoking is a very minor risk factor for disease; extrasensory perception exists; certain star signs are associated with sporting achievement; EEG measures correlate very highly with IQ; psychoanalysis reduces the chances of recovery from neurosis. No other prominent psychologist has been so wrong so often. Surprisingly, there was sometimes compelling evidence that his views were wrong at the time he expressed them. For example, I doubt whether sufferers from Buerger’s disease would agree with his view, expressed in a 1991 book, that smoking isn’t addictive – these patients have partial limb operations because of gangrene caused by smoking. In many cases, this doesn’t deter them from continuing to smoke and having more and more of their limbs amputated. Buchanan refers to the numerous methodological shortcomings in my father’s research. Sometimes these were more extreme than implied by Buchanan. Good questionnaire items are short and unambiguous, but here is an 84-word one from a questionnaire devised with Grossarth-Maticek: Do you change your behaviour according to consequences of previous behaviour, i.e., do you repeat ways of acting which have in the past led to positive results, such as contentment, well-being, self-reliance, etc., and to stop acting in ways which lead to negative consequences, i.e., to feelings of anxiety, hopelessness, depression, excitement, annoyance, etc.? In other words, have you learned to give up ways of acting which have negative consequences, and to rely more and more on ways of acting which have positive consequences? As Buchanan points out, my father built his approach to individual differences on the solid foundations of several giants associated with UCL such as Galton, Spearman and Burt. He developed a superb descriptive model of personality that has scarcely been bettered and contributed numerous ingenious theoretical insights. However, he took his eye off the ball by trying to exceed the fame (and citations!) of Sigmund Freud with comparably grandiose speculations. If only my father had focused his research more on behavioural genetics rather than wasting his time tilting at an endless succession of windmills! - Reviewed by Michael Eysenck, who is Professor of Psychology at Royal Holloway, University of London.